After nine years and countless hours of service, Jordan Montgomery spent last Saturday completing the very last task he needed to become an Eagle Scout, the highest rank attainable for Boy Scouts. For his project, the 17-year-old wanted to support Ricky’s Retreat, an AIDS hospice in his hometown of Bakersfield, California. He converted an old carport into an enclosed storage unit, a place where the hospice staff could store donated wheelchairs and hospital beds. The building effort brought together volunteers from two very different parts of Montgomery’s life - the members of the Mormon community that he was raised in and that sponsors his Boy Scouts troop, and members of the local LGBT community. While his fellow troop members were accepting of Jordan after he came out, his mother Wendy Montgomery claims Mormon troop leaders didn’t always treat Jordan well. Some called him hurtful names, she said, and others made it tough for him to earn badges. It got so tough that the family switched scouting troops. The program ends when boys turn 18, at which point many apply to become scout leaders. Although he could have applied to become a leader, Wendy says Jordan plans to leave the scouting world after receiving his Eagle Scout badge. The troop leader at Jordan's previous unit did not respond to a Huffington Post request for comment. Jordan's current Scoutmaster, Michael Phillips, said the family may have had bad experiences in the previous troop, but he doesn't know details about it. Since Jordan has been at his current troop, Phillips said, he hasn't discouraged him from participating in any activities. "We’re all individuals in different troops and everyone has different ways they treat people, " Phillips told HuffPost. "I'd hope everyone would be welcoming to all the boys that want to participate in scouting." The Church of Jesus Christ of Latter-Day is the nation’s largest sponsor of scouting, according to the Associated Press, serving more than 427, 000 boys in nearly 38, 000 scout units. But that may soon change. 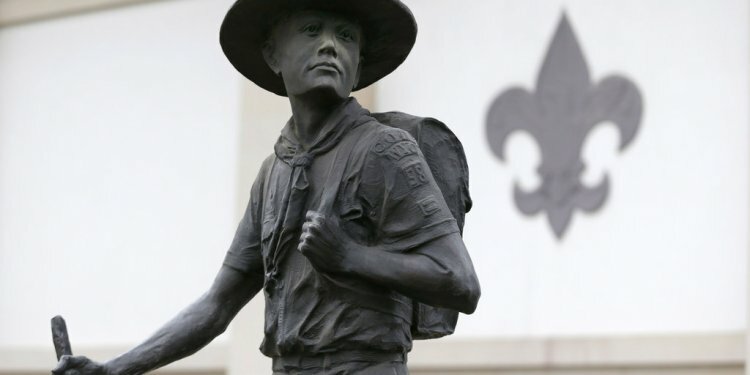 In a statement, the church has announced that it is re-evaluating its links with the Boy Scouts in America program, after the national organization’s executive board voted on Monday to admit openly gay Scout leaders. “The Church has always welcomed all boys to its Scouting units regardless of sexual orientation. However, the admission of openly gay leaders is inconsistent with the doctrines of the Church and what have traditionally been the values of the Boy Scouts of America, ” the church said in its statement. The 45-12 vote, the result of years of introspection within the organization, prompted many gay Eagle Scouts to sign up for volunteer positions. However, church-affiliated troops are still free to exclude LGBT adults from leadership positions. The United Methodist Church and the Roman Catholic Church, also significant sponsors of Boy Scouts programs, both endorsed the new policy. The Methodist Church is leaving decisions about accepting LGBT scout leaders up to individual church units. The Roman Catholic Church, although wary about the change, is “cautiously optimistic” about its religious exemptions. Catholic Bishop Robert Guglielmone of Charleston, South Carolina, who helps manage Catholic scouting programs, said he doesn’t think the Roman Catholic church can cut ties with the BSA. Jordan Montgomery at Scout Day Camp in 2008.